Baltimore champ remains unbeaten; three former fighters inducted into Maryland Boxing Hall of Fame. When West Baltimore’s Gervonta “Tank” Davis won the 130-pound world title last year at Brooklyn’s Barclay’s Center, it was one of the most exciting bouts of 2017. Four months later, Davis stopped top-ranked contender Liam Walsh of England with a sensational third-round TKO in London. Then, he stumbled. Not in the ring, but at his next weigh-in. Davis, scheduled to fight on the much-hyped Floyd Mayweather-Conor McGregor card this past August, came in two pounds over the 130-pound super featherweight limit and had to forfeit his title. Not that Davis needed to redeem himself—he’s already achieved so much in his young career—but he made sure everything was in order in his return to the Barclay’s Center late last month. The 22-year-old, now 20-0 with 19 KO, scored a dominant third-round TKO over Jesus Cuellar, who fell to 28-3, capturing his second world title in the process. For Davis, who dropped Cuellar three times, it may have been his most impressive performance to date. And, now there’s talk of a fight against Ukrainian Vasyl Lomachenko, who also holds a world title, in what could become one of the bigger bouts of the year if it comes off. Speaking of boxing, we also wanted to give a shoutout to the three former local pro fighters and seven others who were inducted into the Maryland Boxing Hall of Fame this past Sunday night at Michael’s Eighth Avenue. Ed Griffin - super lightweight, 1991-2000, 16-9, 5 KO's, Baltimore, MD. Les "White Lightning" Johnson - super welterweight, 1989-1994, 21-2, 15 KO's, Rockville, MD. 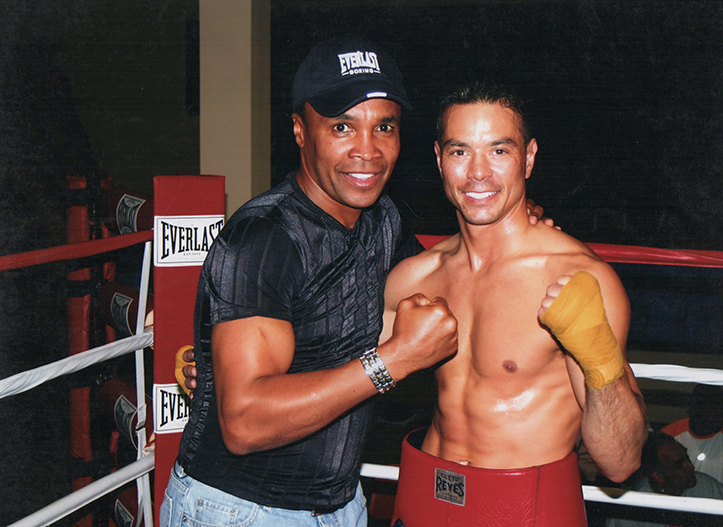 Mike "Little Rock" Ricasa (pictured below with Sugar Ray Leonard) - lightweight, 2004-2006, 7-2, three KO's, Ellicott City, MD. Hal Chernoff - has been training fighters at the Main Street Gym in Salisbury, MD since 1993. David Sewell - former pro boxer who turned to training fighters out of the Charm City Boxing and Sweet Science of Boxing Gym in Baltimore. J.D. Brown - a valued member of the Sugar Ray Leonard camp, who also managed William Joppy during his three WBA Middleweight title reigns. Ed Sauerhoff – former pro boxer who became a promoter. Scott Wagner - promoted the legendary Ballroom Boxing events at Michael’s Eighth Avenue from 1995-2010. Wagner died in February at the age of 49. Warren Boardley - a native of Baltimore, was 43-8 as an amateur and won the South Atlantic AAU Championship at 132 pounds. Dominic Zannino – a native of Baltimore, was 26-6 as an amateur. Zannino won a South Atlantic title in the early 90's and a regional title in 1998. No doubt, Tank Davis will be honored alongside this group one day, too.